It’s widely known that multi-generational housing can have many benefits, including more affordable living, help around the house and quality time with loved ones. And as people continue to live longer, it is becoming more and more common for families to join together to share a living space. However, before you get scared off by the idea of having your mother-in-law (or any other relative) sharing your home with you, read ahead to see why building a mother-in-law suite can actually be a win-win for everyone involved. What Exactly is a Mother in Law Suite? 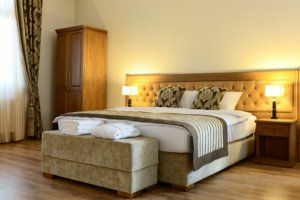 The mother in law suite is aptly named because these home additions are often used to accommodate in-laws who move into their adult children’s homes at a certain age. Most commonly a secondary suite built on the property of a single dwelling, in most cases, the mother in law suite is incorporated into a home as an addition, or by converting a basement or extra room over the garage into a small apartment-like area. In some situations, the mother in law suite might include a full kitchen, complete with its own electrical, plumbing and HVAC units, while other areas in the space include a bathroom, bedroom and general living area. Mother in law suites come in a wide range of sizes today and can be built or added-on to many locations on a property. Most importantly, there is no hard and fast rule about whether or not your mother in law has to be the actual person residing in the suite. In fact, some homeowners use mother in law suites as small income properties by renting them out. If you’re thinking about building a mother in law suite, there are several factors to take into consideration. Keep in mind that a professional contractor will know what to consider when building your addition, but you should still have an idea of how everything works. 1. Size and Location. The first step in building your mother in law suite is deciding where to put it. This includes deciding how big you can actually make the addition. This also will determine the type and style of the addition. 2. Building Codes and Zoning. Do your research early on in the process about building codes and your city’s rules for zoning to ensure you can legally build the addition. 3. Consider Who Will Be Living There. When building a mother in law suite you must keep its future residents in mind. For example, if it is for an actual relative or in-law, then they may need special features to make navigating the space easier. This may include wider doorways and hallways to accommodate wheelchairs or walkers, specially equipped showers or baths with guardrails and non-slip flooring. House plans with mother in law suites have become more popular over the last few years. And the added benefit to creating an additional living space in the home – or elsewhere on the property – is that the space is a great selling piece when it comes time to eventually sell your home. When building a mother in law suite, your biggest and most important decision will be the home addition contractor you choose. At Republic West Remodeling, we are experienced at building home additions, such as mother in law suites, so you can trust us to do the best job possible with all of the expertise and knowledge we have. Contact us today to schedule your free consultation today!